A couple of days after doing my post on crochet terminology, I had a phone call from a friend who wanted help learning to crochet. She had already worked out some of the basics herself, and when she came to see me she had a project with her. I asked a few questions and we quickly established that her problem was exactly what I had written about in my last post. 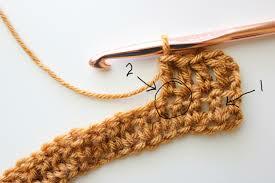 She had started off with the UK terminology for crochet stitches and the pattern she had was American. She had been unaware until that point that there were two different systems so, as the pattern was not accompanied by any stitch descriptions, she was finding herself unable to get the results she was expecting. We spent a pleasant couple of hours catching up and working our way through her pattern. She went on her way with a clearer understanding of her project, and a printed copy of the conversion tables from my post. I would like to mention a very good book that I have recently rediscovered in my book case. It is the “Reader’s Digest Complete Guide to Needlecraft”. If you have a copy you will know why I am recommending it. If you don’t, I really think it is worth trying to get hold of one. It is listed in My Amazon Store. This book has clear, straight forward diagrams, instructions and illustrations on a number of needlecrafts. The section on crochet takes you from the very basics of getting started, through a large range of stitches and motifs, to how to design and assemble garments. I bought me copy over 30 years ago so the copies available on Amazon are later versions than mine, and will probably be even better. Good luck and I hope you enjoy it.